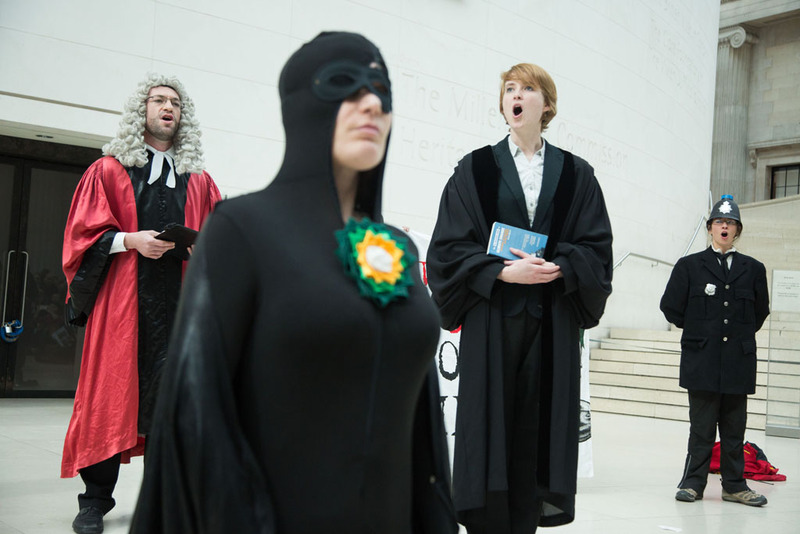 Performers put BP on trial for “gross deception” at British Museum – BP or not BP? Posted on March 29, 2015 by BP or not BP? Holmes and Watson return for BP and a final showdown! For interviews and photos, email “BP or not BP?” on info@bp-or-not-bp.org. On Sunday at 3pm, a large group of protesters descended on the British Museum in a flashmob protest against the museum’s controversial sponsorship deal with BP, watched by several hundred museumgoers. 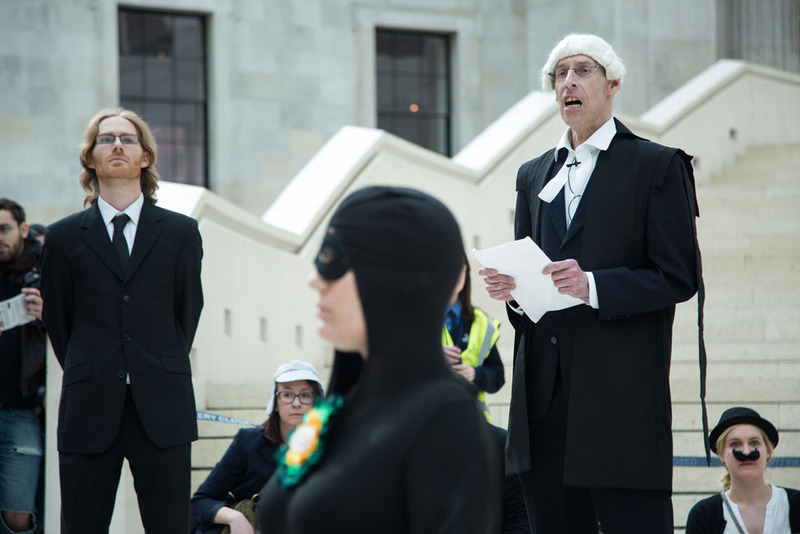 Dressed as famous police detectives, the group sang and searched for clues, before occupying the museum’s Great Court and holding a “people’s trial” of BP. The protesters accused BP of “gross deception” for attempting to cleanse its tainted brand through cheap sponsorship deals. A recent Freedom of Information request revealed that BP’s donation to the museum in 2000-2011 was just 0.8% of the museum’s income – an “embarrassingly small” amount, campaigners say. The theatrical flashmob began when two performers, dressed as Sherlock Holmes and Dr Watson, launched into a rewritten version of Michael Jackson’s “Smooth Criminal”, with lyrics highlighting BP’s corporate crimes. The oil company is officially the world’s biggest corporate criminal, having received the largest criminal fine in history ($4.5 billion) in November 2012 for its role in the Deepwater Horizon oil disaster. Many other detectives emerged from the afternoon crowds of museumgoers, before setting off to find the villainous BP, in the form of a human “oil spill”. Once apprehended, the performers put BP on trial in front of a judge and gave evidence by presenting images of BP’s high-risk extraction projects in the Arctic and the Canadian tar sands. They also recited the words of a Gulf Coast resident impacted by the Deepwater Horizon spill. The oily tyrant was then declared guilty and banished from the building in a musical procession. Pressure is mounting on museums and galleries with links to oil companies. Last week, 36 leading climate scientists wrote an open letter to American museums and galleries, urging them to break their ties with the fossil fuel industry. In January, the Tate was forced by an Information Tribunal to reveal details of the funding it receives from BP. Over 17 years, Tate received an annual average donation of £224,000 from the oil company – around 0.5% of its income. The annual cost of buying the Tate’s support is roughly the same as a 30-second TV advert during the X-Factor final. The British Museum continues to defend its controversial sponsorship relationship with BP, despite the Deepwater Horizon drilling disaster, the company’s decision to start extracting highly polluting and destructive tar sands oil in Canada, its enormous contribution towards climate change, and its partnership with Russian state-owned oil company Rosneft in order to exploit the hazardous and vulnerable Arctic. Having pleaded guilty to fourteen criminal charges over the Deepwater Horizon disaster in 2012, BP is now in court facing a fine of up to $13.7 billion under the US Clean Water Act – with other claims still to come. In 2014, a senior judge in the case ruled that BP bore the majority of the responsibility for Deepwater Horizon, due to the company’s “grossly negligent” behaviour. 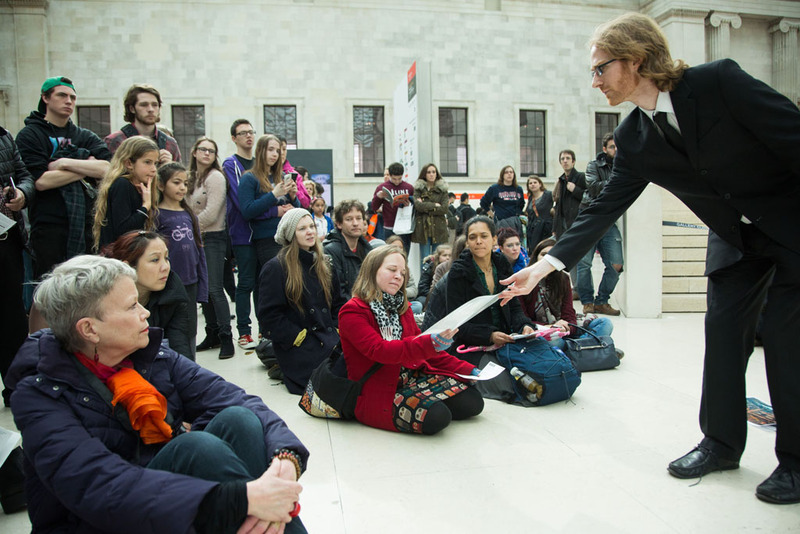 This was the ninth performance hosted by the activist theatre troupe, “BP or not BP?”, at the British Museum. Last month, the group gave a Sherlock Holmes-themed performance, setting the scene for today’s flashmob. Other performances have included a series of Viking invasions in protest at last summer’s BP-branded Vikings Exhibition and a Shakespearean flashmob to coincide with the 2012 BP-sponsored Shakespeare exhibition. WATSON: So, this is it, Holmes – the British Museum! We’ve returned to our country’s greatest cultural institution, home of marbles, mummies, Ming and other loot! WATSON: Look at all these detectives, Holmes! Moustaches, disguises and magnifying glasses! We’ve got a top team who will sweep the museum from Tutankhamon to Timbuktu. POLICE PERSON 1: I’ve seen BP! Downstairs, I saw a name on the wall. It said – “The BP Lecture Theatre”. POLICE PERSON 2: I’ve seen BP! Over there, the BP logo is on posters for the new ‘Indigenous Australia’ exhibition. REVEAL PERSON: Look! It’s BP – they’ve been hiding among us all along! Coats are taken off to reveal the BP spill figures in morph suits. Policemen take hold of them. JUDGE: Order! Silence in court! This people’s court is now in session. Today’s trial brings together British Petroleum and the British Museum. One is great in villainy, the other stands accused of aiding and abetting in crime. The court will hear evidence and pass judgement. Counsel for the prosecution – you have the floor! Today, I shall lay out evidence that will show beyond all reasonable doubt, that BP is also guilty of gross deception, by sponsoring this museum! With each piece of evidence/exhibit, the lawyer speaks. COURT CLERK: Witness places hand on copy of ‘This Changes Everything’. Do you promise to tell the truth, the whole truth and nothing but the truth for the sake of the Earth? COURT CLERK: Please repeat the words of the witness after each phrase, so that all gathered here may hear their statement. [To the witness] You may begin. Members of the crowd can come forward and give evidence via the ‘human microphone’. We will also have pre-written extracts and facts. LAWYER: Your honour, I believe that we have shown beyond all reasonable doubt that BP is, indeed, grossly deceptive. For a tiny sum, of 0.8% of the museum’s income, their logos are all over these walls, their brand is cleansed. BP’s crimes have been hidden away here too long. I rest my case. JUDGE: Thank you, counsel. Grave crimes indeed. In a moment the court will hear the court’s verdict. Jurors, members of the public, let us take a moment of silence to reflect upon the evidence heard, the impacts that BP continues to have on the planet and its inhabitants on land and sea, and the role the British Museum plays as accomplice. 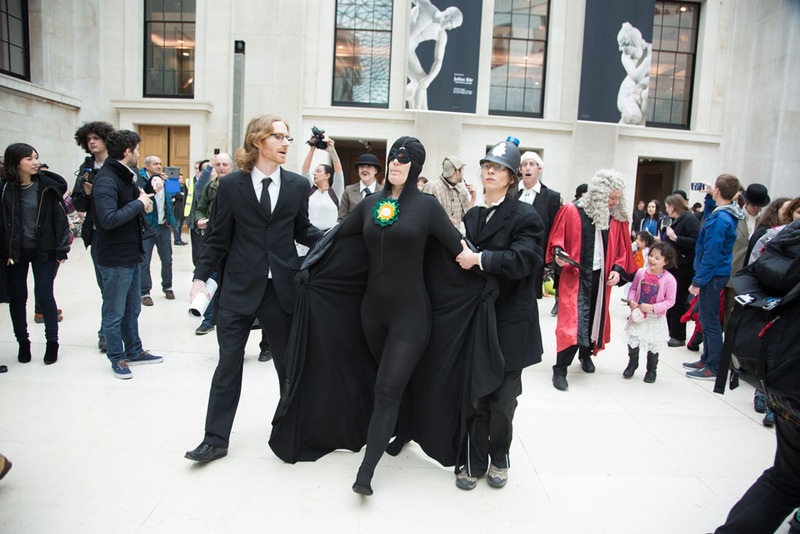 JUDGE: The British Museum is charged with being complicit in BP’s climate crimes. Jurors, is the museum guilty or not guilty? JUDGE: To charge of cleansing the name of BP for a tiny sum – is the museum guilty or not guilty? JUDGE: To the charge of Gross Deception – guilty or not guilty? JUDGE: BP – Judgement has been passed, let justice be served. I hereby order BP to be ejected from the British Museum, and may BP’s oil remain in the ground! This is a place of culture, not criminals! Take them away, and take their logos away with them! Policeman take BP spill people away out the entrance.